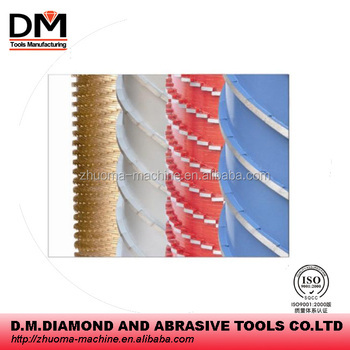 all diamond tools for polishing line and calibrating line can be offered. These wheels are made of diamond powder mixed with metal powder (working as bond) by the way of sintering. It is the most common used squaring tools for ceramic tiles/ granite slabs/ marble slabs' edges. Compared with similar products, our wheels are approved for good sharpness and fine edging effect, which is helpful for the fine processing and polishing after. The advantages of our diamond squaring wheels can be summarized as following. 1. Good sharpness, long working lifetime and low working noise. 2. Good uprightness and precise size of processed tiles edges without breaking and chipping. 3. Strict production process control and stable quality. 4. Individual formulation and grit match are available for different ceramic tiles quality.